It's been raining all day, with a weird strong, cold light. This kind of weather always gives me major headaches and puts me in a somewhat sluggish mood. I randomly came at the illustration above from This Paper Ship (be sure to have a look at their website - they're so talented!) 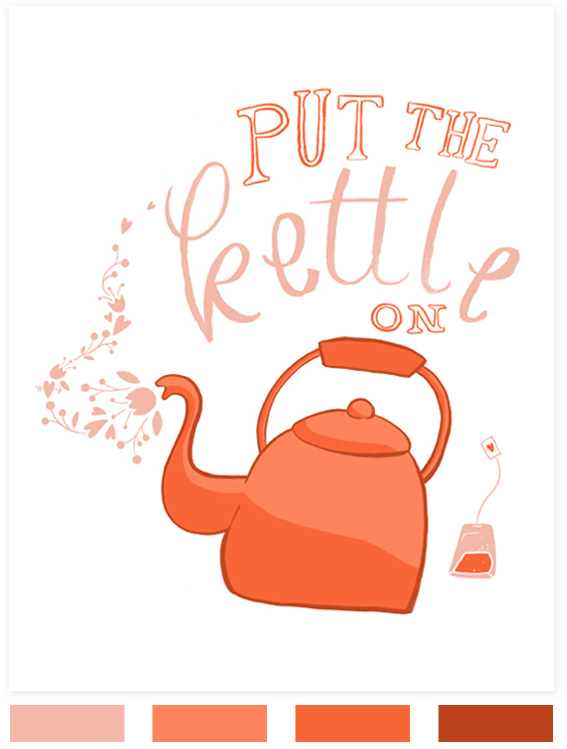 and thought I would follow its advice and indeed, put the kettle on. I made a pu-ehr tea and drank it slowly - it's the best medicine ever for headaches! Sometimes I feel like tea is the answer to all small pains and worries. Anyhow, hope you're having a lovely day - thanks for stopping by today! I'm sorry you're having headaches! I am in the mood for a nice cup of tea, now. I've never heard of pu-ehr tea before and had to look it up. Can you pick that up at the grocery store? As a tea drinker myself I could see myself putting that picture up in my kitchen, the heart on the teabag is adorable! Well I have honestly no idea. I live in Switzerland and you can't find that at the grocery store here. I buy mine either from a local chinese tea shop or online at Mariage Frères. I hope you'll find some to try it out - once you get used to the unusual taste, pu-ehr tea is almost magical. I love the invitations. I love receiving paper invitations and therefore like giving them myself!